Nairobi What would you do in a plane for seventeen hours between New Orleans, Washington, Zurich, and finally Nairobi? Try to sleep, surely. I tried that. Watch a movie or two? Ok, but that can be a climb. Read, yes, absolutely. Among other books I read on these flights was one about block clubs in Chicago. The author, historian Amanda Seligman, had come up to me when I visited at the University of Wisconsin-Milwaukee, given me her card, and written the name of her recently published book on the back, Block Clubs in Chicago: How Neighbors Shape the City. I read it on my Kindle with interest. I’m sure we’ll talk about block clubs more sometime in the future, but a couple of things piqued my interest. 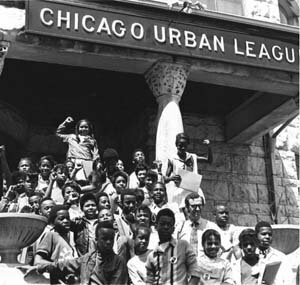 Seligman’s book introduced me to the role of the Urban League in forming block clubs in Chicago, as well as other cities in the 1950s and early 1960s under various grants from donors, some of them meddling, who were dedicated to “racial uplift.” Interestingly to me, she covered some of the organizing problems the League’s team had in making contacts on the block in order to build the clubs. Here’s the other question that fascinated me from Seligman’s research. She found that up until relatively recently the Chicago Police Department employed more than twenty community organizers in a community policing program. She made the point several times in the book, that the CPD in effect had the largest community organizing program in the city with the most organizers on their payroll. Given the more recent problems between the Chicago police and the community, I had to ask, why with such a supposed commitment to community organizing and community policing, did they have such a horrific record in actually dealing with the community, especially the nonwhite community? What happened there? How did this go so terribly wrong? Was it just the police or a defect in the organizing? There are some people who play games on planes. Others that take enough of whatever to knock themselves out. There are people who work math problems in their head, so I have heard. For me, these are among the kinds of questions that take over my mind in the space left between the roar of a plane’s engines.